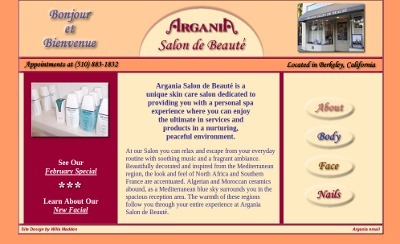 When I was asked about creating this site I was already a huge fan of the Argania day spa. The owner provided me with a three-fold brochure, and her business requirements. From there I developed the tone for the site. I researched its hallmark exotic products and wrote the content that you see for most of the feature landing pages. The site was created using Dreamweaver and Fireworks, and includes a little Flash file. I have heard it described as a visually sensual user experience. This style was meant to complement their services. In 2012, while I was working for the EPA, this client hired a new designer. See the current Argania site. This is the first web site I created for Ted and Mary Bayer. I used Dreamweaver to set up templates for the different galleries, and Flash to create an engaging home page. Fireworks and Photoshop were also used, to create, manipulate and optimize the dozens of images used throughout the site. Visit Bayer Sculpture Studio's current portfolio site. When this client handed me his requirements, the list for home page links exceeded 15. We sat down and analyzed what the content was to address, and found the common threads between his requirements. The result was a much more concise site architecture. Then the fun began! Access to his original content is limited. You have only the bones here to review. 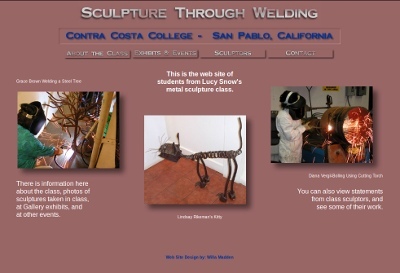 In 2003 I decided to study the art of welding sculpture. It was an exciting medium, and I really liked the other people in the class. Most of them had no way to display their work except through gallery openings, so I created a web site for the class. This 'startup' hired me in 2004 as they were meeting with several big-time players, like Microsoft. They needed for me to quickly create their online presence so they could talk about the team and their product. Once serious funding occurred, they hired a large firm to build their site. The company "turned out the lights" in 2009. Visit the original web site I built: Nanochip, Inc.
A political scientist, and published author for 46 years, Michael Parenti was my first client. It was his foresight that led him to the Internet, and his goal to keep his archive accessible and simple that drives his site design. Using Dreamweaver, Fireworks, FrontPage, Notepad, and Photoshop, I created graphics and the site's architecture. In addition, I am the photographer for several of his book covers (front and back) as well as for his Wikipedia page. From October 1994 to January 2003 I was employed at World Savings Bank. My duties ranged from Business Analyst, to Systems Analyst to my last role there as a Programmer Analyst. From 1999 to 2003 my duties focused on programming and designing web pages and VB applications for internal use. Many of the web sites and applications I developed for World were proprietary, and not available for public viewing. Below I've included sample links for two of the sites that highlight my web designs, and have briefly described the business purposes. While some page-to-page links may work, many will not. My career at World Savings came to an end as I chose to remain in the San Francisco Bay Area when my department was relocated to San Antonio, Texas. World Savings Bank was sold in the Spring of 2006 to Wachovia Bank, which was then absorbed by Wells Fargo Bank. ALPS: June 2002 - January 2003 Management requested a web site for the Automated Loan Production System (ALPS) project. The goal was to raise awareness and share information about the new legacy system with Loan Department field and back-office staff. Several features involved ASP pages and are not available here. 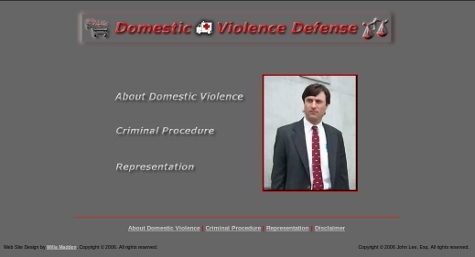 This site was created solely by me using Flash MX, Dreamweaver and Fireworks. The views to sql data will not pull a result. I hope you have enjoyed your review of my Early Web Projects portfolio. Return to my current portfolio at: Willa Madden - Web 2.0 Projects. Reach out if you think I can help with your project, by contacting me, "willa" at this domain, willamadden.net.